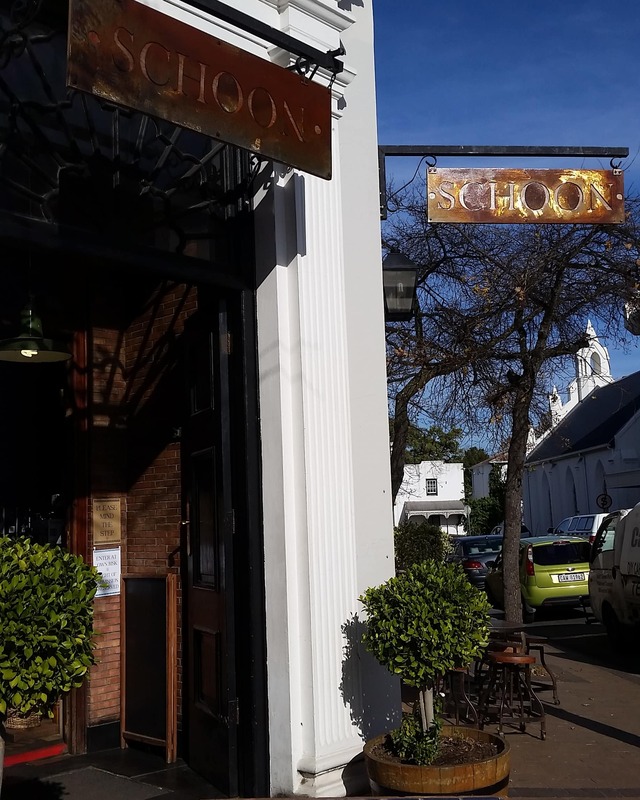 Stellenbosch isn’t particularly well known for it’s cuisine, but with the help of some great local restaurants and a thriving new food scene, that’s starting to change. Our first stop was Schoon which is owned by a lovely couple . They specialise in producing freshly baked breads, delicate pastries, artisan Ice Cream, Organic produce & Dairy and coffee. Schoon also has Boutique Wine section upstairs where the offer a unique variety of less known wine brands which the new partner of the business, John (I think) personally selects and stocks for the shop. They specialise in something different so look through the window and don’t even try to resist temptation. We got a few chocolates and headed next door for a wine and chocolate pairing. Brampton Wine Studio was our next stop. This is a stylish, chic and intimate venue that attracts people of all ages. They produce a range of fruit-driven wines with a strong, colourful personality, reflected in the modern and stylish packaging. We had Lemon Sorbet Truffle paired with Unoaked Chardonnay, Strawberry Dark chocolate paired with Rosé and Chocolate Truffle paired with Old Vine Red. My favourite combination was the Lemon Sorbet and Unoaked Chardonnay as I am a white chocolate lover and I find dark chocolate quite bitter. Hanli then led us into Schoon again and suddenly I was hungry. They make unique and delicious flavoured Ice Creams like berry cheesecake and salted caramel. I had the White Chocolate Brownie Ice cream known to locals as the “Blondie” and as a gelato lover I give Schoon my seal of approval! Just when I thought I couldn’t possibly stomach any more food, we were off to a butchery to learn about the art of biltong making and to also taste some droëwors. Behind all the amazing food is hard working families, fascinating stories and age-old traditions. Hanli Fourie is an accredited tour guide whose passionate about sharing Stellies incredible cuisines with hungry and curious locals and travellers. * I was welcomed as a guest of Stellenbosch Wine Routes, but all opinions are honest and my own. ? EVERYTHING about this post made me drool, lol… but you had me at wine. looks like such an amazing time! I’d recommend a week. As I was there for 3 days but there was so much to do and I didn’t even do everything I planned on doing. Great Thanks! Looking forward to hearing more about this place. You had me at Strawberry Chocolcate and Rose. What a foodie’s paradise. Totally agree the best way to meet and interact with local people is over food. Is Stellie a day trip from Capetown? or would you recommend a long weekend? I’ve never been to South Africa, but one day I hope to get there. 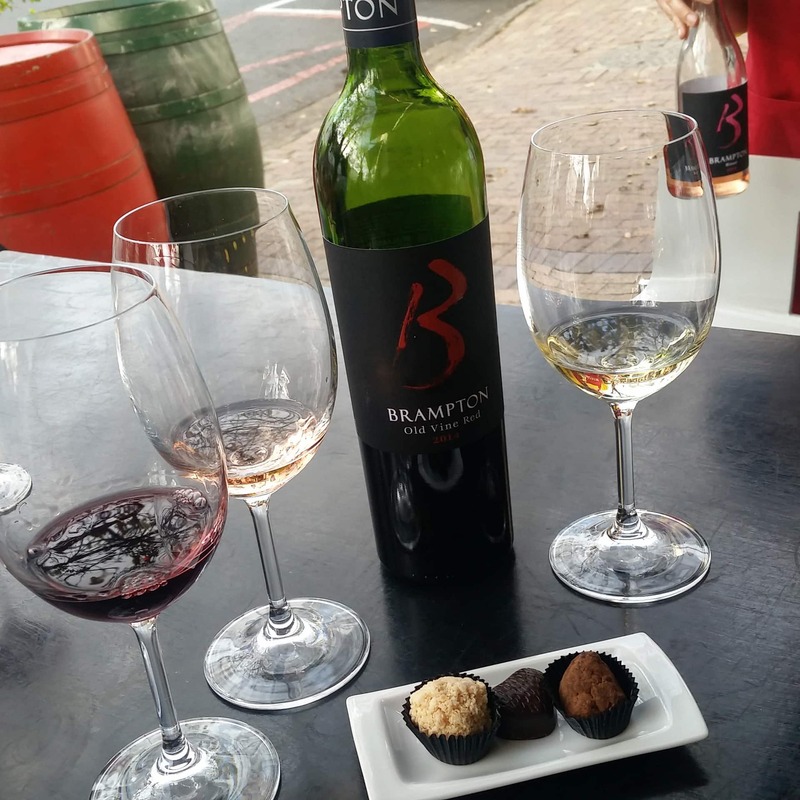 I’m not a wine person but I’d go just for the extras–the chocolate looks amazing! I love the architecture of the first place you mentioned. But I didn’t notice a location/map listed… is this in Germany? I agree with you! The best way to learn about a town is through its food. I always go to the local restaurants and avoid all touristy restaurants even if I have to struggle with the language! That bread looks yum! Did you have henna on your hand?